Relieved to be sleeping in rather than waking up to venture out into the bush for one last time, we took it easy and enjoyed the quietness at breakfast since most guests were away on the morning game drive. A family of warthogs were chilling by our doorstep, sooo……. our efforts trying to capture out of focus and totally digital zoomed in pictures of them running away during our game drives in Namibia were good for nothing. We left the hotel in an open safari car and drove over to the Kazungula border, 20minutes away from the lodge and a long a** queue of trucks in waiting. The drivers wait for days to cross the border on a ferry because only ONE OR TWO trucks can cross at a time. It was pretty straight forward for us, we unloaded our bags, checked out of Bostwana (paperwork fast and efficient) and got on the speed boat. Five minutes later or less?, we were on Zambian soil. The ‘ride’ was pretty interesting, because we were on the part of the Zambezi River where the borders of all four countries met: Namibia, Bostwana, Zambia and Zimbabwe. As soon as we set foot in Zambia we were pressured to buy souvenirs. We exchanged our extra slippers and shoes for animal sculptures, and then got our visas on arrival for USD 50, a single entry visa for 30 days. In our case; one day and a half. There were people everywhere, selling random things and offering to exchange dollars, our clothes and gears. The border was a whirlwind of crazy chaos, a prelude to Zambian life. ….. outside Livingstone. Two and a half hours later, 116KMS, we arrived at Avani Victoria Falls Resort in Livingstone, where wild animals roamed freely on hotel grounds surrounded by beautiful gardens and British colonial decor. 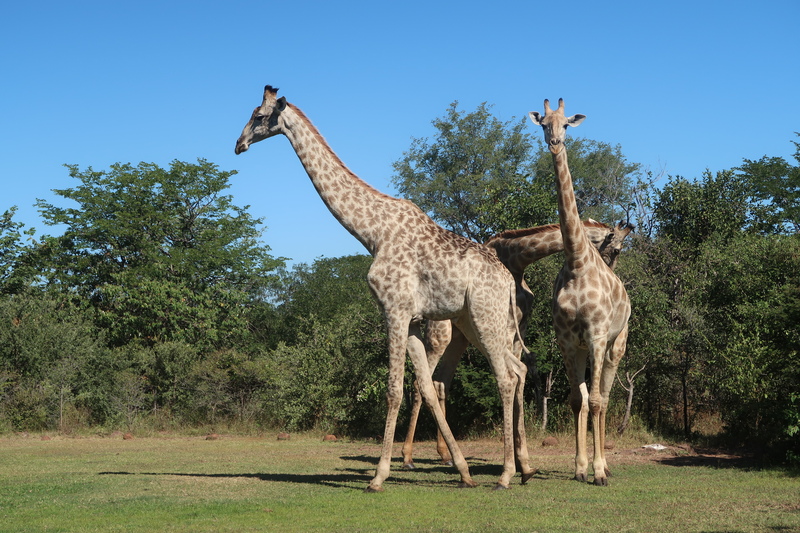 Giraffes ,we were dying to see in Namibia, were in our faces. Before we started our tour to the Victoria Falls, our guide insisted we take the helicopter tour to take a good panoramic look. For USD 150 per person? Hell nah, we declined and opted to enjoy the view on a postcard. We drove for 15minutes to the entrance of the Falls where we put on our raincoats and tuned out the guide’s monotonous ramble of facts already known. The closer we got to the falls, it just got louder and louder. Water levels were at their highest, there were plenty of rainbows, and we were constantly sprayed. Up close, it was the most amazing experience everrrr. We asked our guide if we could walk on the bridge to Zimbabwe. He said it costs USD20 because ‘it can be “DIFFICULT” to convince the police at the border’, we said OKAY WHATEVER and went for it. It seemed like he was doing us a favor. On the way a ton of people harassed us to buy things, but there were no signs of border police. The bridge was covered in blue, not paint, but hundreds of LOUD school girls on a field trip giggling, pointing at us and having a good time. Laughter turned into cheers that just got louder and louder as an American tourist was getting ready to bungee jump off the bridge. We joined in the fun (not bungee jumping) and made some new friends. After we paid our guide a handsome tip, in addition to the USD20, we realized that walking to the bridge was absolutely free and no big deal. 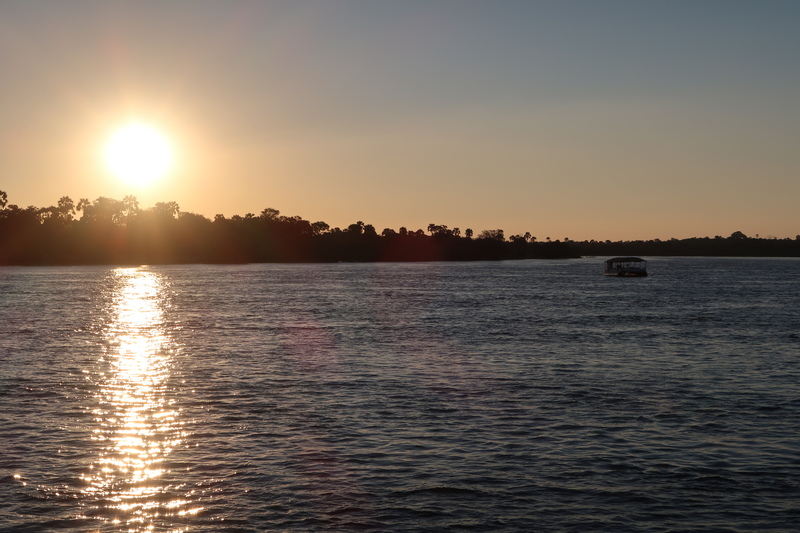 Later that evening, we went on a sunset cruise that looked like a hotel along the Zambezi River. We drifted away from the smoke risen by the Falls and enjoyed free flowing drinks on the boat. While the sun set with grace, hippos were grunting faintly in the background harmonized by the sound of the waves gently crashing and birds bidding farewell. It was a magical ending to our epic 10 day road trip. I had to pinch myself to make sure it wasn’t a dream.